Hi ho cherry-o! 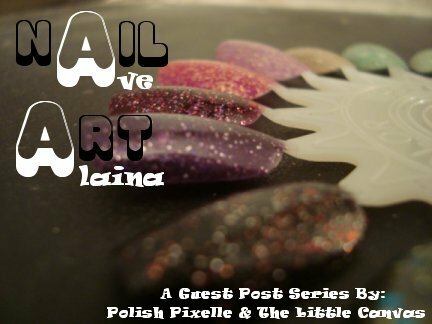 Ave from Polish Pixelle here with the first of hopefully many guest posts in a series we are calling nAil Art. For this month we chose the theme of bugs - I had initially planned on doing ladybug nails but at the last minutes decided to go with bees instead. Alaina knew from the beginning that she would be doing bee nails so I suppose the theme kinda just turned into... well, bees. For my sky background I chose to use Avon 'Vintage Blue' which I just picked up from a flea market (random, I know) this past weekend. A perfect sky blue! I have been dying to do a dotted trail bug mani for a while now - I see these often and always think they are so adorable. A really quick and easy way to have some fun nail art! Unfortunately about a week ago one of my nails split horribly and I had to cut my nails down to nubbins. I had originally intended to do some more designs (I wanted to add 'BzzZZzzz...' somewhere!) but didn't have enough room on my pathetic nubs. So if I could change anything I wish I had been able to add that in! I'm extremely pleased with how this came out - super fun and easy, and excellent for summer! Don't forget to check out Alaina's version of bee nails over at my blog. 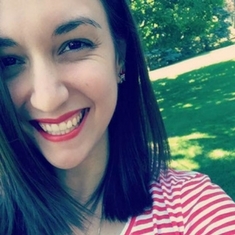 If you have any suggestions for themes for our guest post series, please let us know in the comments section! Ave, these are adorable!!! I love them!!! the sun, the drag line, the lil bee...just too cute!!!! I was going to attempt something similar to this with the bee on the thumb and the track line on the other four fingers, but I thought it was too bland! I love LOVE how you put the sun on the thumb! beyond cute!